Tooting Bec tube station; minicab office; launderette; kebab shop. Hang on, though, this kebab shop is crammed with tables and chairs, and some very pleased-with-themselves diners clinking glasses. 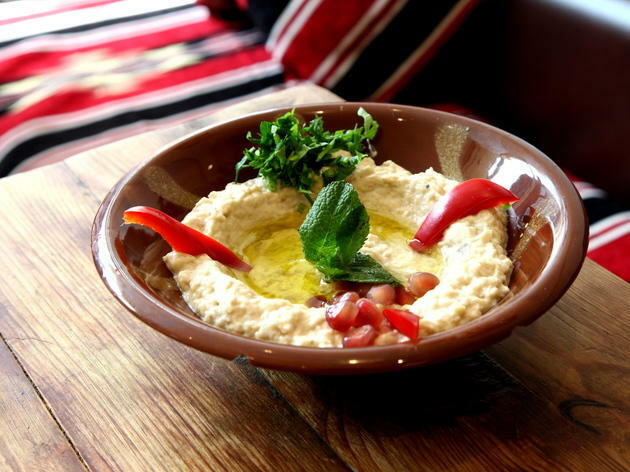 A tiny Lebanese licensed restaurant, Meza has a kitchen smaller than a Beirut takeaway stall, but manages to turn out a sizeable menu of meze and grilled dishes freshly made to order. Sitting at the bar counter, as we did, you can see why the expression ‘open kitchen’ was coined – no sprig of flat-leaf parsley can be out of place when you’re under this sort of scrutiny. 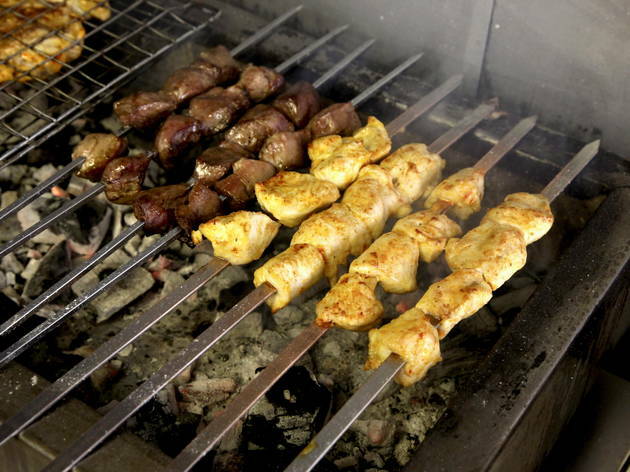 Fortunately, the chefs never put a fuul wrong, from the perfectly crisp-shelled falafels to the aubergine dips seared with the whiff of the charcoal grill. Highlights? Everything. Even the Lebanese wine was enjoyable, and priced keenly at around £15 a bottle. The manager was subdued on our most recent visit, but in the past we’ve seen him greet every customer like a new best friend, and service is consistently friendly and casual. The only catch with Meza is its popularity; you need to book weeks in advance on a mobile phone number to get a good slot, and table-turning is now the norm. 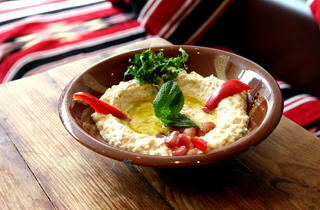 There is a second branch of Meza just a little more than a mile away. For details and a review, click here. So delicious. Go for the set menu and try a bit of everything! Just cracking quality simple fresh food. Always consistent even when busy and really friendly staff. Love takeaways or eating in! Feel so lucky to have this place nearby. Everything is so tasty, I could eat the hoummus and the chicken every day. The best restaurant around. Beautiful food. Micro restaurant with take away possibility, you should have a go if you fancy Lebanese gastronomy! It's tiny but it's delicious. My bedroom window looks out over the kitchens and the smell of delicious barbecueyness is regularly wafting up in my direction. The only reason I don't go here more is that it's always been cash only and I never have any cash, although this is probably better for my health and bank account, seeing as I have a tendency to order half the menu. Favourites are: moutabal (similar to baba ganoush), grilled kallaj (pitta bread stuffed with halloumi) and farrouj meshwieh (a kind of spatchcocked chicken that I would say is better than Chicken Shop's. I know, right). Incredible food. Absolute gem and lovely service. Fabulous food and well priced. will definitely come back! What a find. Every time we eat here we wonder, "why haven't they expanded?" and then quickly hope that the won't, because it's our tiny, special place where everyone has to cram the heck in to enjoy great food. They say that some things are small and perfectly formed and this is one of them. The food is exceptional. The atmosphere is too because it's about a shared experience--the hiss on the grill, the smells, the closeness of your fellow diners (don't get me wrong--this isn't some kind of sardine case, but it's crowded in the best of ways), the amazing food. 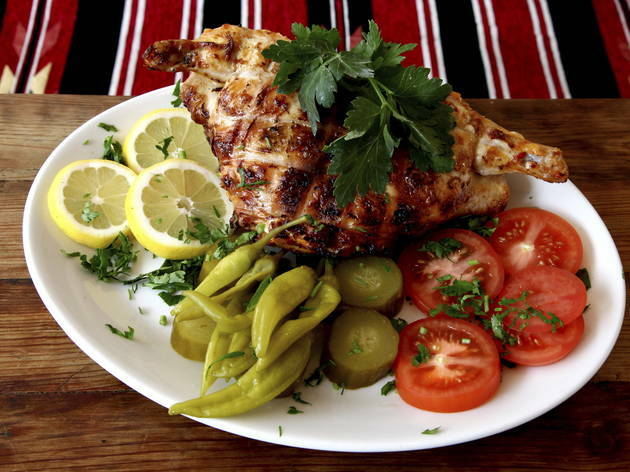 It all adds up to something so much better that just another Lebanese restaurant. A good note to raise is about the staff. The table staff and manager are wonderful. Polite, friendly and accomodating. And those guys slaving over the hot ovens and grills are just amazing. I've worked in restaurants before and never seen such an organised and civil one in my life. Which is good, because they're about three feet from you. Fantastic fresh food and wonderful friendly service. I love the fact they only serve lebanese wine and beer. Have been there with a couple of friends and with a group, and both were wonderful experiences. I can't say enough good things about Meza. The food is amazing. Every single dish. And the prices are so cheap. We get a collected order here once a week and it usually comes to about 20 pounds for two of us, but of the most amazing food for that value. It's just great. Excellent food, delicious. If you come in and the tables aren't packed, you're very early! This place is fantastic! The food is amazing, atmosphere cosy and the people that run it just fabulous. Definitiely my favourite place in Tooting. Have been here three times in two weeks! Brilliant! Lovely team. Great ingredients simply cooked and served without fuzz and ripp-off prices. Easy to get a table for lunch but book your diner. Excellent food and service, completely agree with Carolina's comment below. It's small but cosy - and if the chicken livers happen to be on special, I highly recommend them! Went last night. Lovely staff, food, atmosphere, everything. Do not hesitate! Great food, great atmosphere, great prices! Not only is the food the best I have ever eaten but Meza has the intimacy and customer service that you just cannot find anywhere else in London. 10/10! Its a great place with a great owner. The food is fantastic and it is so fresh! The size gives it a charm and personal touch. 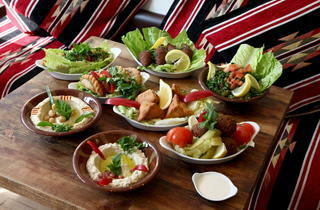 Fresh, delicious, lovingly cooked Lebanese food. The owner made us feel very welcome and seemed to know most of the clientele by name. Tooting is lucky to have this new eaterie and no wonder recommendations have spread like wildfire in the neighbourhood. 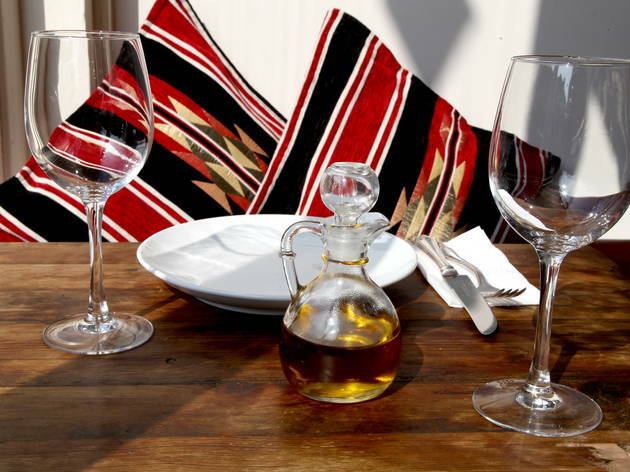 Gastro-pilgrims, look no further, 'cause Heaven awaits you in Meza. Enjoy! 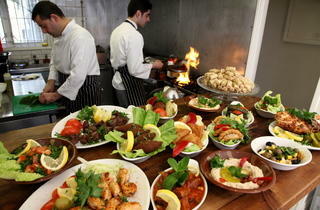 As a Lebanese myself, I am proud to say that Meza Tooting is simply the best Lebanese restaurant in London. Not sure I should be adding to the glowing reviews that Meza rightly receives as I still want to be able to get a table there next time! 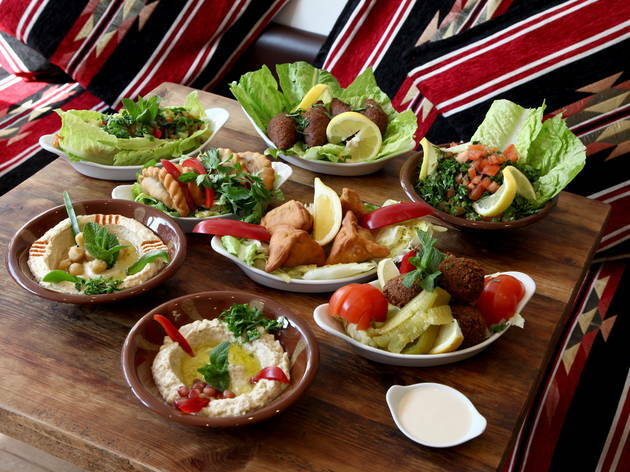 Fantastic taster menu which combines quality with huge quantity, don't fill up on the delicious flatbread and dips before the skewers arrive! Not quite sure why this only gets 4 stars from Time Out. I can't think of anywhere better for friendliness, food quality and value. Definitely 6 stars. So delicious and consistently packed with people. 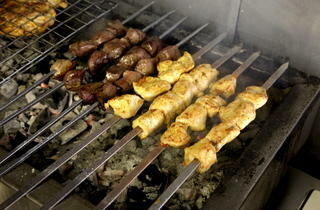 The chargrilled aubergine dip is amazing and the chicken grill is the best I've ever had. I went on a Saturday night and the next day immediatley booked for the next weekend it was that good. YUM! It was our first visit to the place, and I can't wait to go back. We sat up at the bar overlooking the kitchen, which was great watching the chef at work preparing our food. 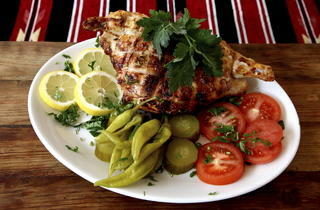 The food is delicious, the atmosphere friendly, and the prices very reasonable. A great little place! I cannot rave about this place enough. The staff were so freindly and welcoming and verything that came out of the tiny open plan kitchen was just delicious. We got a bit carried away with our ordering and were told we had ordered too much and received suggestions of what dishes would work best together. Leftoevrs were parcelled up no questions and i am looking forward to tucking in again at lunch. I will be back. Have eaten here twice - both times the food and service (well hospitality really) was excellent. The sort of place that has unsurprisingly picked up a loyal following from day one. This wasn't just the best Lebanese food I've ever eaten, but also one of the best restaurants I've ever been in. Small (well, tiny) and family-run, the three guys in the kitchen put out amazing fresh and tasty food. Great value and friendly service and a lovely cozy space to enjoy. Definitely recommend a visit, even if it's miles away from home. Probably wise to reserve a table. This is one of the best restaurants in London. Besides the food being excellent, it is the fantastically friendly and charming owner and his staff that really makes this little place special. I have been addicted since it first opened and I have seen it grow in popularity ever since. This is definitely a little gem of a local restaurant in South West London. Great little restaurant, lovely food, lovely bloke who runs it and really nice atmosphere. 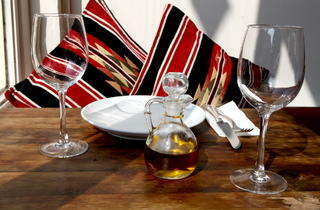 Oh and try the Lebanese wine. Highly recommended. GREAT place...intimate setting, warm and comfortable surroundings and food prepared with care and expertise. The small staff, from the top down, are all friendly and outgoing. Without a doubt it's one of the most fun and enjoyable restaurants on either side of the river. An amazing place that feels like my grandmas kitchen. Staff are so humble and welcoming you feel right at home, and the food is so authentic and unbelievably tasty. By far the best place i have been to in London, we now make it a regular feast. Amazing place. Delicious food and entertaining hosts. It's great to experience a meal where they care so much about what they do. what a great place - delicious food, served by by the charming owner. Can't find fault with it at all, and the bill is so reasonable! For me, there are several tick boxes required to make a restaurant a great one. Firstly, obviously, the food needs to be (at least) good and, for me, good value. 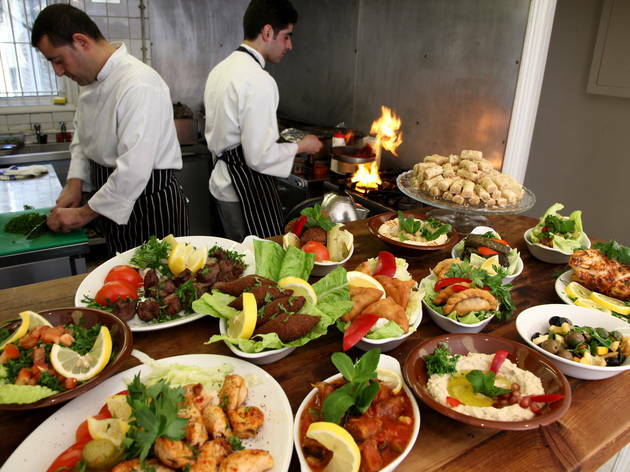 I am pleased to say that at Meza, the food is superb; delicious and well presented (my Lebanese wife agrees) and consisting of generous amounts, all at extremely competitive prices for this cuisine. Secondly, atmosphere. Although I questioned whether or not a tiny restaurant positioned almost ON a traffic-heavy part of Trinity road could possibly offer intimacy or atmosphere of any kind. I was wrong. Meza put me at ease on all counts. In fact, the only interruption to intimacy, is the fact that SO many people come through the door, hoping for a table. The final tick box is hospitality. The Time Out review itself mentions the appeal of the place due to the charm of the owner and this comment is spot on. He is polite, quiet and calm (even in the face of mounting orders, both in the restaurant and take away orders over the 'phone) and, no matter how busy, always finds time for conversation. He is so friendly that you WANT him to do well, you WANT him to succeed, and it feels good to eat and drink there knowing you are helping (in some small part), his foray into the restaurant owning business. The fact that it's the most local Lebanese restaurant to our house, just makes it all the more special. If you are familiar with this type of food, make the trip there - you won't be disappointed. If you are new to it and want to try, you couldn't have a tastier introduction. If you're a little unsure as to what to try, mention it - he will be more than happy to bring you a varity of dishes to try, but never over ordering on your behalf. (He often stops us when he thinks we are making pigs of ourselves!) Thanks to the above points, Meza has quickly, and effortlessly, become one of my/our favourite places to eat. I'll see you there! Fabulous food and decently priced. A great addition to Tooting Bec, will definitely come back! Food was excellent - very fresh. Service was attentive. We were very happy and will be returning soon. One of the best Lebanease eatery I have been to. Very pleasant and friendly atmoshpere. Great authenic food. Had a great expereince and the owner is very wonderful and friendly. Can't wait until my wife and I go back. Worth driving 45 mintues. Great little place - tasty food and a warm welcome - I'll definitely be coming back. Don't forget to take cash! They don't accept plastic. But I agree with the article, the food was amazing and the host is wonderful. This place is just incredible... it's the best lebanese I have ever tried! Glad you are giving the little gem some attention. can I also point out that you can also get their delicious food to takeaway. perfect for a quick stop on the way home.